Out-of-the-box DocLogix solution for procurement management is dedicated to accelerating and automating the procurement and supply process, as well as cutting operational costs. It also makes the whole process more transparent and easier to track. 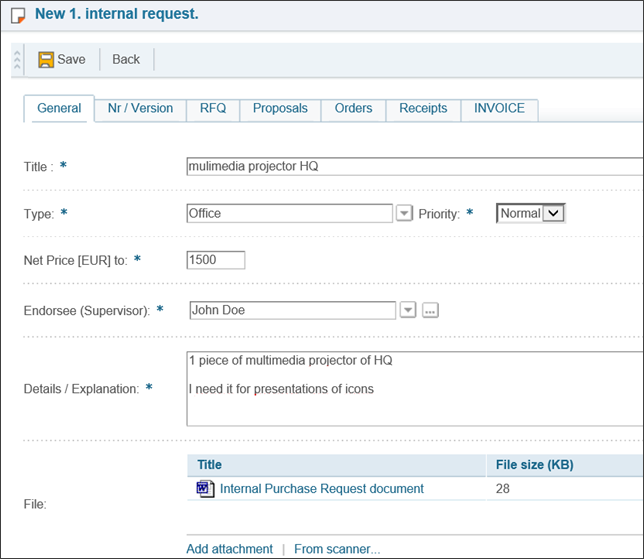 Our solution is widely used by modern organisations to centralise and manage procurement activities such as issuing and approving purchase requests, gathering and evaluating proposals, issuing purchase orders, approving invoices, storing information about suppliers and deals, and analysing procurement information. INCREASED SAVINGS through centralisation and standardisation. Our solution ensures tighter control, standardised processes and the power to negotiate with vendors, keeping unapproved spending to a minimum. Control is enabled through the approval process, whereby the person responsible assesses requests on the basis of the intended budget. Organisations that use a single, integrated procurement solution have been found to achieve results for managing spending and making savings that are 46% better than those that do not. IMPROVED PERFORMANCE via automation. The automation of processes simplifies the procurement life cycle, with workflow functions and automatic notifications speeding up operations by reducing time lags between tasks. An automated approval process eliminates a large amount of manual work. User-friendly previews for attachments and metadata. It is estimated that companies that use automated procurement processes perform faster and deliver goods and services 40% more quickly than old-fashioned ones. SMART DECISIONS based on accumulated information. Whether using the DocLogix solution alone or integrating it with your accounting system, it is a great tool for viewing organisation-wide spending. It will show you bottlenecks or unreasonable purchasing in your procurement chain and will help you identify cost-saving opportunities. Every user can quickly access relevant information through the use of dashboards and charts. Transforming raw data into business information is easy. For example, our visualisation tool allows accountants to predict demand for cash on a certain date. The system allows the buyer to upload all incoming purchase proposals and easily compare them using various criteria. The software stores all information about existing vendors, including feedback from your staff about the quality of their goods or services. This allows better decision-making for future procurement. More accurate and BETTER QUALITY PROCESSES. The workflow functions of the DocLogix system ensure that everyone involved knows what duties to perform and when. Automatic notifications provide reminders about upcoming deadlines and help to prevent tasks from overrunning. The whole process can be tracked – a critical feature for companies that operate in line with the requirements of quality management systems. Who can benefit from the solution? Grzegorz Beszczyński, Head of the Quality Management System, Wrębowa Sp. z o.o.